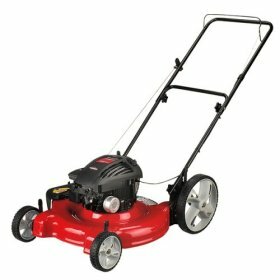 I own a Craftsman Briggs and Stratton 158cc push lawn mower. It is a great lawn mower for the name of the brand alone. The name Craftsman gives you the reassurance that it will last nearly forever. I have owned this lawn mower for a little over a year and it is great. I do not leave the bag on as I prefer it to do self mulching, which is a great feature this lawn mower offers. It also has an option to recycle the grass and blow if off the side if you do not wish to use the bag. And this makes it easy to dispose of the grass. It is very easy to start up with its safety lever and being a woman, I appreciate the fact that it is not hard to push. It has got six different positions so if your grass gets too high it is easy to adjust the blade. I did find that the oil filler hole is a perfect size for a twenty ounce bottle but I found my lawnmower to drain oil quickly. Overall, this lawnmower is extremely durable and cuts many different heights, just watch out for the amount of oil you will have to use.